Borneo has become a very popular holiday destination in recent years. Polular Borneo holidays include adventure holidays, jungle trekking holidays, beach holidays, orang utan and wildlife safaries, bird watching, and diving. Many visitors spend their honeymoon, Chinese New Year, Easter or Christmas at one of the many top resort hotels. Many popular tourist hotels and resorts are located only a few miles outside Kota Kinabalu in Sabah, as well as outside Kuching or Miri in Sarawak, which are great starting points for many Borneo tours to Borneo’s wildlife, nature and cultural attractions. This is a selection of popular Sabah, Sarawak, Kalimantan and Brunei Travel Tours. Most visitors book a Borneo holiday at one of the major hotels and resorts outside Kota Kinabalu. 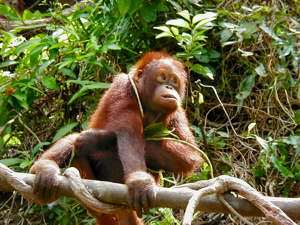 Holidays are usually offered for one or two weeks and several tour operators offer Borneo package tours, which include flights and accommodation. There may be also excellent hotel rates available at various online hotel booking sites, offering primarily rooms at 3, 4 and five star Borneo hotels and resorts. Sabah’s most popular holidays include stays in Kuching, which has a range of good hotels and resorts within the town and its vicinity and is within easy reach of some of Sabah’s national parks and wildlife and cultural attractions, the region outside Miri which is the gateway to Mulu National Park and the Niah caves, as well as other national parks and other wildlife and nature sights. Several nature and wildlife tours can be easily arranged at the hotel and some popular Borneo tours take only up to a day. In particular some longhouse and orang tours are only day tours. One of the largest resorts in Sabah has its own small orang-utan sanctuary.